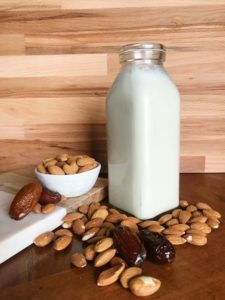 Almond milk is a great alternative to dairy milk and is also very easy to make. Use this basic, Easy Almond Milk Recipe and add different flavors to it to give it your own spin. Low in sugar and carbs and high in protein and Vitamin E, this beverage is protective against cancer, Alzheimer’s disease, and heart disease. Add it to your coffee, your oatmeal, or drink it by itself and enjoy. Almond milk is a great alternative to dairy milk and is also very easy to make. Use this basic, Easy Almond Milk Recipe and add different flavors to it to give it your own spin. Low in sugar and carbs and high in protein and Vitamin E, this beverage is protective against cancer, Alzheimer's disease, and heart disease. Add it to your coffee, your oatmeal, or drink it by itself and enjoy. Put the almonds in small bowl and cover with cold water until just barely covered. Soak overnight for approximately 10-12 hours. Remove the water from the almonds. Place the almonds in a blender with the vanilla extract, dates, and water. Blend until completely uniform. Place the cheesecloth over a large bowl. Pour the milk into the cheesecloth and strain the milk into the bowl until all the pulp is removed. Discard the pulp and transfer the beverage to a jar or pitcher. Serve and enjoy.